This book provides the first overview of the service technologies available to telecoms operators working in a post-convergence world. Previous books have focused either on computer networks or on telecoms networks. This is the first to bring the two together and provide a single reference source for information that is currently only to be found in disparate journals, tool specifications and standards documents. In order to provide such broad coverage of the topic in a structured and logical fashion, the book is divided into 3 parts. The first part looks at the underlying network support for services and aims to explain the technology that makes the user-visible services possible. This section covers multimedia networking, both traditional (legacy) and future (softswitch) call processing, intelligent networks, the Internet, and Wireless networks. Part 2 deals with how these services may be analysed and managed. Chapters cover topics such as commercial issues, service management, quality of service, security, standards and APIs. Part 3 concludes the book by looking ahead at evolving technologies and more speculative possibilities, discussing the kinds of services that may be possible in the future and the technologies that will support them. Covers brand new technologies such as JAIN, JTAPI, Parlay, IP, multimedia networking, active networks, WAP, wireless LANs, agent-based services, etc. Kenneth J. Turner is the editor of Service Provision: Technologies for Next Generation Communications, published by Wiley. 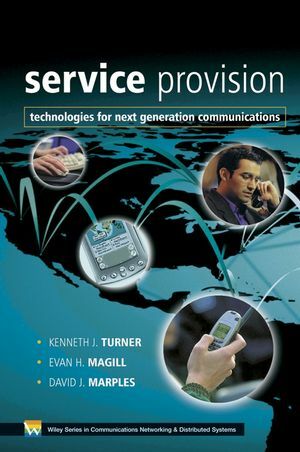 Evan H. Magill is the editor of Service Provision: Technologies for Next Generation Communications, published by Wiley. David J. Marples is the editor of Service Provision: Technologies for Next Generation Communications, published by Wiley. PART I: NETWORK SUPPORT FOR SERVICE. 1. Introduction and Context (Kenneth J. Turner, Evan H. Magill and David J. Marples). 1.2 Network Support for Services. 1.3 Building and Analyzing Services. 1.4 The Future of Services. 2. Multimedia Technology in a Telecommunications Setting (Alistair McBain). 2.2 Market Drivers for Multimedia. 2.3 Standards for Multimedia Services. 2.4 Multimedia Services and their Constituent Media Components. 2.5 Interworking between Multimedia and Traditional Voice. 2.6 Terminal Equipment and User Interfaces. 3. Call Processing (Graham M. Clark and Wayne Cutler). 3.1 The Beginnings of Call Processing. 3.2 Key Attributes of Call Processing Systems. 3.3 Switch Architectures and Call Models. 3 . 5 Call Processing for Intelligent Networks. 4. Advanced Intelligent Networks (Robert Pinheiro and Simon Tsang). 4.1 History of the Intelligent Network (IN/AIN). 4.3 Components of IN Service Delivery. 4.5 Assessment of Intelligent Networks. 4.6 Future of Intelligent Networks. 5. Basic Internet Technology in Support of Communication Services (Marcus Brunner). 5.2 Transport Service Quality in the Internet. 5.5 Open Services Gateway Initiative. 6. Wireless Technology (James M. Irvine). 6.6 The Future of Wireless. PART II: BUILDING AND ANALYZING SERVICES. 7. Service Management and Quality of Service (Pierre C. Johnson). 7.2 What is Service Management? 8. Securing Communication Systems (Erich S. Morisse). 8.5 Security in Practice – Digital Cash. 9. Service Creation (Munir Cochinwala, Chris Lott, Hyong Sop Shim and John R. Wullert II). 9.3 Services in the Public Switched Telephone Network. 9.4 Internet-Based Data and Communication Services. 10. Service Architectures (Gordan S. Blair and Geoff Coulson). 11. Service Capability APIs (John-Luc Bakker and Farooq Anjum). 11.2 Telecommunications Information Network Architecture. 11.3 Java APIs for The Integrated Network. 12. Formal Methods for Services (Kenneth J. Turner). 12.1 What is a Formal Method? 12.2 Classification of Formal Methods. 12.3 Formal Methods for Communications Services. 12.4 Formal Methods for Telecommunications Services. 12.5 Evaluation of Formal Methods for Services. 13. Feature Interaction: Old Hat or Deadly New Manace (Evan H. Magill)? 13.3 Feature Interaction in POTS. 13.4 Response of the Communications Community. 13.7 Future Services, Old Interactions. 13.8 Future Services, Future Interactions. 13.9 Future Services, More Complex Interactions. 13.10 New Challenges, New Opportunities. PART III: THE FUTURE OF SERVICES. 14. Advances in Services (James T. Smith). 14.3 Context: Putting Communications in Perspective. 14.4 Context: The next Killer Service Feature. 14.6 SIP: The Oil that makes Context Flow. 14.8 The New Converged Home Network. 15. Evolving Service Technology (Peter Martin and Stephen Corley). 15.5 Genetic Programming for Service Creation. 16. Prospects (David J. Marples, Kenneth J. Turner and Evan H. Magill). Service Provision: Technologies for Next Generation Communications Visit the author's website for an in-depth overview of the book, sample chapters and an exhaustive range of additional refernec material to support the text.